Country Level Engagement and Assistance to Reduce (CLEAR) CLEAR II is a United States Department of Labor-funded project implemented by Winrock International with partners Lawyers Without Borders and Verité. The project enhances government capacity to reduce child labor. 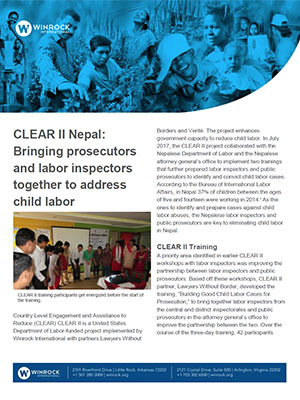 In July 2017, the CLEAR II project collaborated with the Nepalese Department of Labor and the Nepalese attorney general’s office to implement two trainings that further prepared labor inspectors and public prosecutors to identify and convict child labor cases. According to the Bureau of International Labor Affairs, in Nepal 37% of children between the ages of five and fourteen were working in 2014. As the ones to identify and prepare cases against child labor abuses, the Nepalese labor inspectors and public prosecutors are key to eliminating child labor in Nepal.